So after a little too long break comes a new figure review. Todays figure is Homura, the gloomy girl with a firearm and other weaponary fetish. Her origin is the all so famous Puella Magi Madoka Magica, where a more or less sad destiny was delivered to every magical girl involved. Akemi Homura is portrayed as a smart person with a graceful appearance and a cool contained attitude, but actually I never liked her attitude or I don’t like what became of her (episode 10). A disliking for the character doesn’t automatically mean that I will pass on an appealing figure. One thing really caught my interest, this Homura figure was adapted from a GK figure sculpted by Ousaka Miki. I love GK figures but sadly good GK’s are hard to get and are rarely turned into PVC figures. I want to support such things, in hope to see more such adaptions in the future. 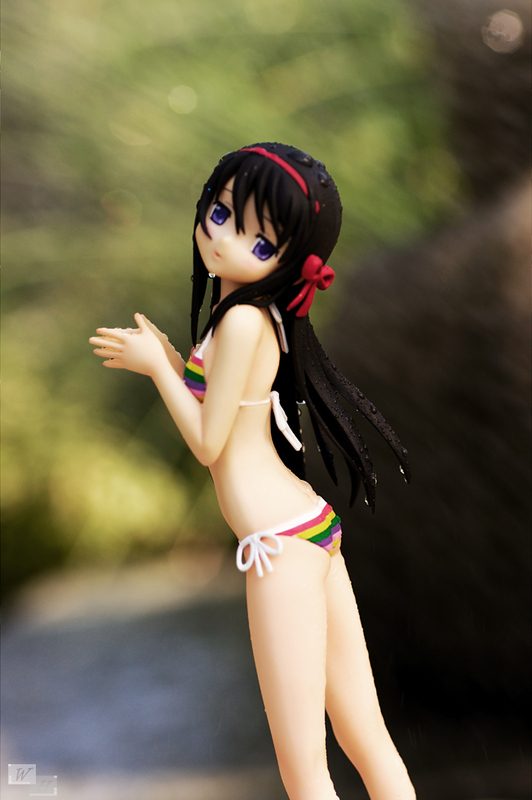 This figure of Akemi Homura was manufactured by Wave and the release occured in the end of June 2013. Wave is very famous for their Beach Queens line, where they adapt the heroines of fresh anime shows in beach attire. These 1/10 scaled figures are of solid, sometimes even very nice quality, they often have moveable neck joints and a nice design overall. As nice as Beach Queens are, 1/10 is a quite small scale and they have a lack of presence when placed next to larger scaled figures. One of the reasons why I parted with mine after some time. Homura might be mistaken for another Beach Queen figure, but surprisingly the figure is scaled 1/8 and part of Waves Dream Tech line. With 1,55 m Homura is a rather small girl, the figure here is 185 mm in height, but for a real 1/8 scale she should be 9 mm taller, but it’s no really big deal. In terms of size and proportions the figure is close to ALTER’s Menma. Homura has nice dark brown hair with nice long strands, I really like the bangs in front. The hair is cleanly produced and leaves a positive impression. There is a red hairband with a ribbon on the left of her head. The face is beautifully sculpted and painted, the rounded corners give her a nice appeal. The anime is captured very well in her face, there are attractive eyebrows, lovely blushmarks that really boost her cute side. And Homura’s eyes are as deep as the ocean. The figure also has a nice little mouth opening, overall her face turned out very pretty. Im not really sure how to interpret her expression, maybe you have an idea. To me Homura seems to be spacing out, there is also a little yandere touch, but also a lot of cuteness can be found. Homura is approximately 14 years old, and as the young teenager she is Homura has a quite petite and skinny body. She is standing straight with her head tilted backwards and turned to the left. This rarely used pose makes the figure quite interesting and gives her a nice touch. On the downside this pose also gives her some strangles, she is supposed to face the viewer. Homura has no real female curves, but she is a quite skin revealing figure, her belly is rather nice as well as the shoulderblades. The sculpting here is also done in a convincing way, she is nearly free of molding lines and these single little fingers are skillfully and cleanly pressed PVC. They could have chosen a lazy way to execute this part of her with no space between her fingers, but they didn’t. The skimpy rainbow striped bikini is very cute and colorful which adds some contrast to the skin and the dark hair. it’s not a super detailed piece of sculpted clothes, but it’s enough to create a pleasing sight. So what are my final thoughts about this Akemi Homura from Wave, Im quite satisfied with her. The face is very detailed and makes a cute figure out of her. I also like her unique and kind of fascinating pose. One thing I learned again was, that I don’t necessarily have to like the character to appreciate a certain figure, when the design is nice and appealing for me and this GK adaption definetely was something I like. Of course there are more cheerful and curvier swimsuit figures, but Moemura manages to convince with her interpretation of vulnerable cuteness. It’s good to see a figure from Wave which is not scaled 1/10, while she’s still not a real 1/8 scale, Homura doesn’t look awkward when being placed next to other 1/8 scaled figures. It’d be nice if Wave made more of their stuff in 1/8 scale. They were the only ones to make a figure of Itsuki Kannagi (Good Smile Company has let us all down), and as much as I wanted to pick it up, I have an aversion to 1/10 scale. If they made their stuff in 1/8 scale, I’d probably have at least a half dozen of their figures. 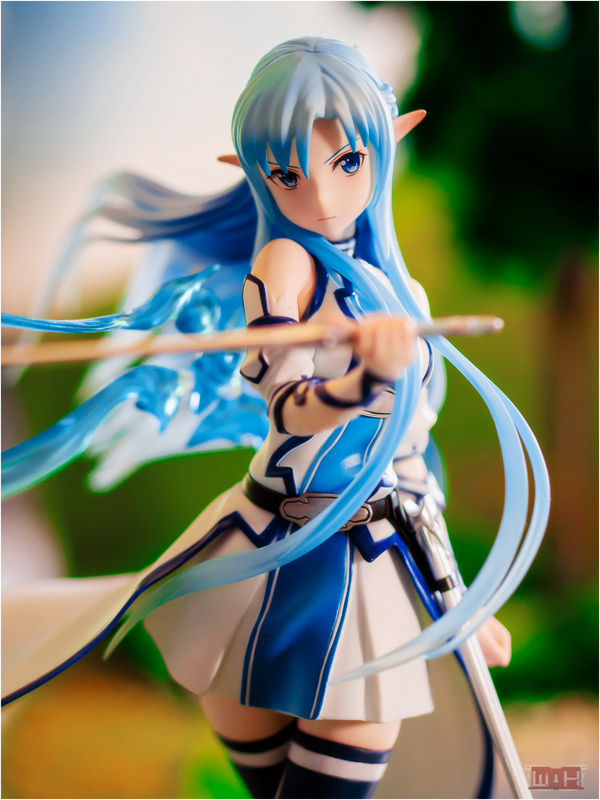 I bought Kannagi as my first Beach Queen figure, she was pretty nice with her curves, but really small of course. Yes, these traitors XD Haha I see andI agree on that 1/8 is way better for cute bikini figures . Maybe an own Beach Queens shelf would be a good solution, but who has so much dedication. Hahaha, I can’t do it. If I don’t even marginally like a character I can’t bring myself to buy the figure. Liking the character or not directly affects my enjoyment of the figure. Yay for a shout, been a while since it happened. Then again, don’t post as much as I used too and not as many figure blogs. Oh well, I can at least try to fix one of those. But yes, I would always hand wave BQ’s, every once in a while though I think Wave outdo themselves and put out some really nice versions of the girls. The Misakas you linked to are a perfect example of that for me. Too bad I had to pass on her, Homura looks nice, I kinda wish Wave would just make their BQ’s this size rather than 1/10th. For the smaller girls they are just so tiny at that scale. 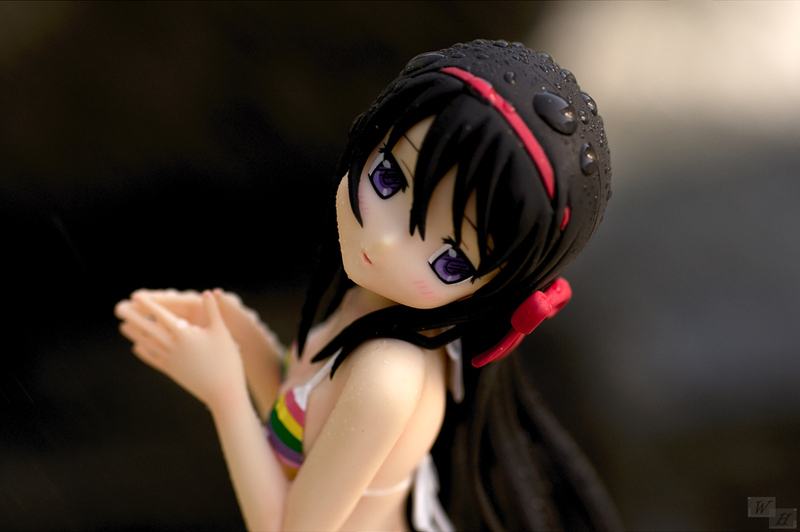 Nice pictures, kinda making me want to incorporate some water into whatever swimsuit figure I take pictures of next. Well ok if I would totally despise someone, I wouldn’t buy a figure of he/she/it either. But Homura is no bad person, close before the end I cared a bit for her. Being small doesn’t mean their bad, the quality is good and sometimes lovely figure are related. I think the Miska’s are among the best ^^ You know the Kuroko Beach Queen I guess *hilarious*. That is a good idea, maybe without clothes XD Well better not. Great review! 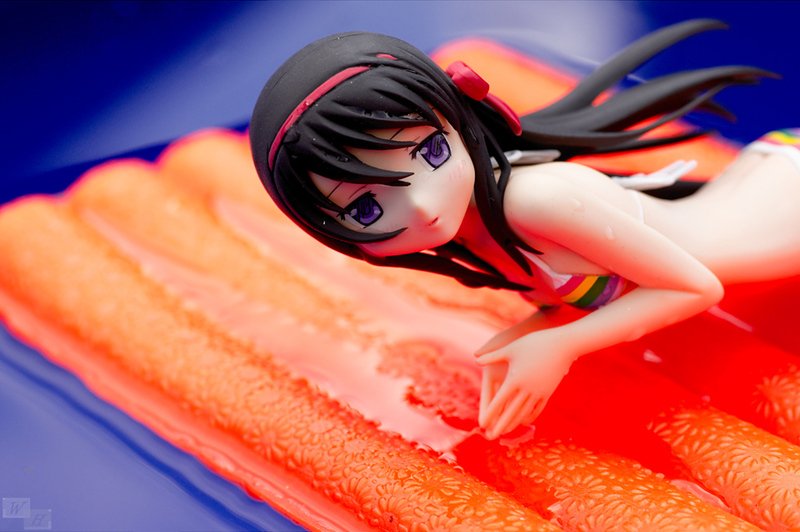 I always remember her looking serious and dark but seeing this figure gives a little lighter Homura, simply enjoying her solitude, cooling off at the beach. I liked this little change. I would have liked this figure of Homura with her post serious personality as well, with the braids and red glasses, so cute. Thats nice to hear, thank you. I make no contract with any Kyuubei’s. Everything they do is mean. Nice Review! 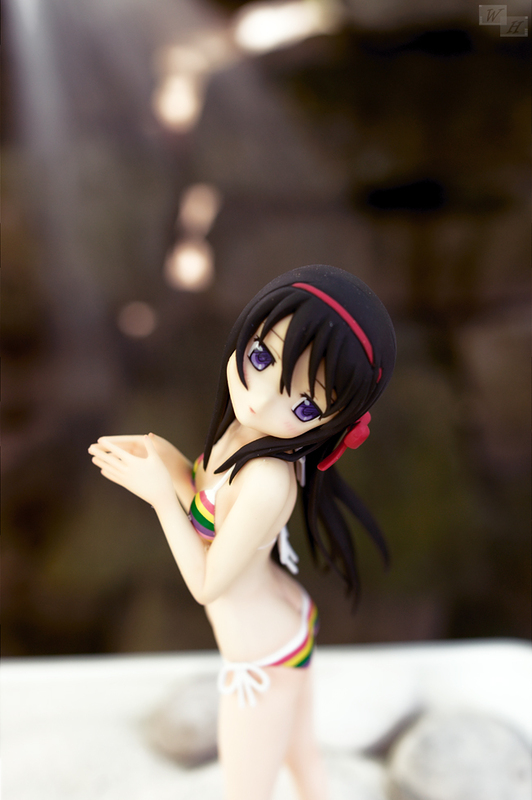 Definitely a nice figure of Homura, she looks really cute! Most homura figures come across as kind of ‘serious’ (well, I guess that’s more her personality) but this one seems a bit more cute and innocent. 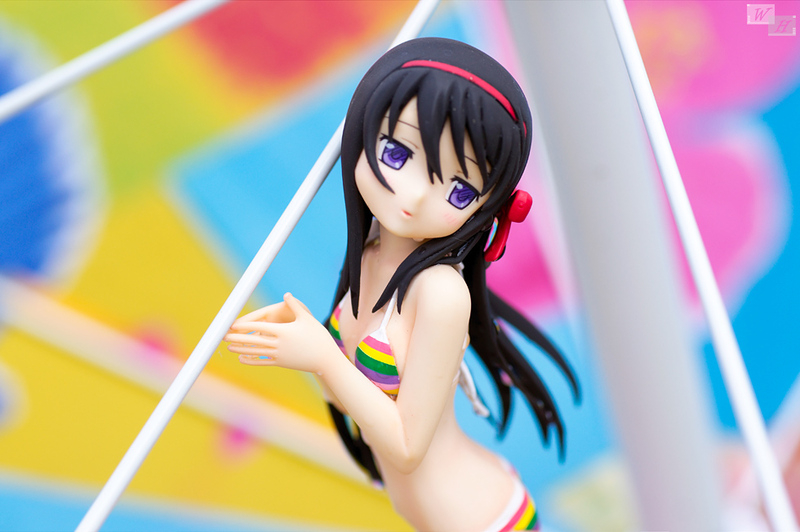 The rainbow bikini gives some nice color to the figure, a plain purple or black swimsuit probably would have made her look a bit bland IMO. Oh thank you, I should write more regularly, since it was hard to find the words this time. She seems for the serious type after her sad events, but I liked the cuteness in this figure. Yeah it is happy colored bikini, I think you’re right about that. I didn’t realize she was 1/8! I’m one of those people who thought she was a standard Beach Queen fig! I didn’t peg Homura as a rainbow sort of girl, but it’s nice to see her wear something other than purple and black. She might not have too many curves, but she does have a surprisingly well defined back. Wave can produce some quality figures when they feel like it. It’s easy to mistake her for a Beach Queen at first, but believe me, she’s bigger than these. The rainbow pattern seems a bit childish for her serious self, but it’s a cute and interesting out of character choice. A good sculptor helps a lot, even when no top manufacturers are involved in the production. It’s difficult to tell, the bakemonogatari head-tilt is definitely yandere – like. I didn’t realise this figure was so CUTE! 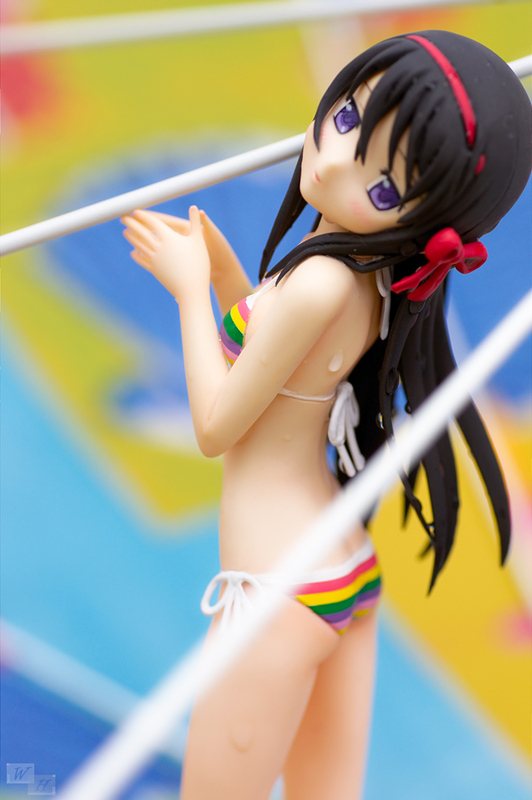 The head tilt, the expression and the pose work really well together although it’s a tiny bit hard to imagine Homura in a rainbow bikini, hehe. She looks really good with the water on her hair and I love your first shot of her, what a sweetie..
It’s pity she’s not a tiny bit bigger although maybe the smaller appearance would give her a cuter look. Yeah I also was surprised and I decided rather late to get her, luckily Hobby Search still had her. It looks quite unique and convincing overall. ahaha maybe Kyubey had chosen it for her, but it’s cute anyway. Thank you very much, it was fun with her. Only around a cm more and she would be real 1/8 scale, but it’s no real letdown, actually.